Hello friends! Today I’m popping in with a cute little girly birthday card I made for one of my nieces. 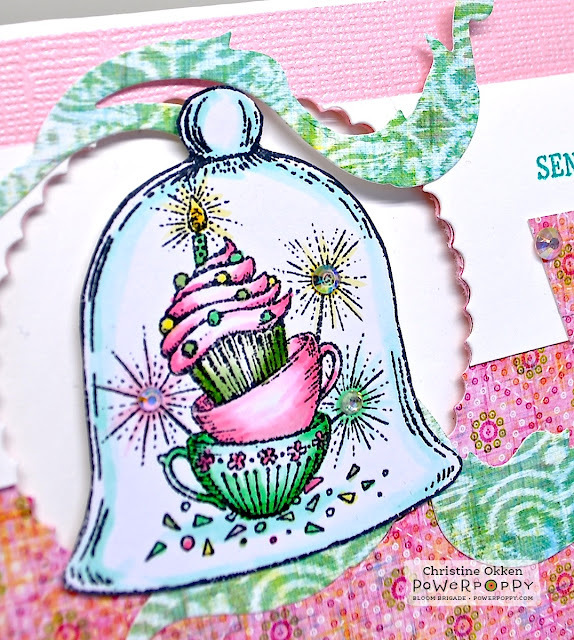 I pulled out the very pretty set from Power Poppy, Under Glass and used the pretty cupcake and cups in this one. I paired it with some pretty patterned paper that I had in my stash, and some sparkly textured paper. I used one of Becky Fleck’s sketches from this last quarter, when the Power Poppy team helped her with samples. I didn’t love it as much as the first card I made with this sketch, but, I think it looks like a party on a card, so it’s perfect for a little niece. For fun and sparkle I added some irridescent rhinestones to the sparkler candles and they take on the tone of the colouring. The larger green swirl is a die from The Cat’s Pajamas. Alright friends, I’m going to take a little hiatus from blogging in the next week or so. We’re celebrating a whole bunch of things as a family including our daughter’s graduation from University! She’ll now be “Miss Okken, elementary school teacher”. We’re really proud of her, and this next week is all about family celebration. I’ll be back with our NEW release from Power Poppy soon! I’m beside myself with excitement to show them off to you! You know I’ve worked for Marcy in some capacity for about 10 years now, and I think this is one of the BEST releases she’s ever done. You will be blown away! Be sure to pop by and see what sweet Katie Sims and the Power Poppy Blog have to show off today too! This sure does look like a party on a card! 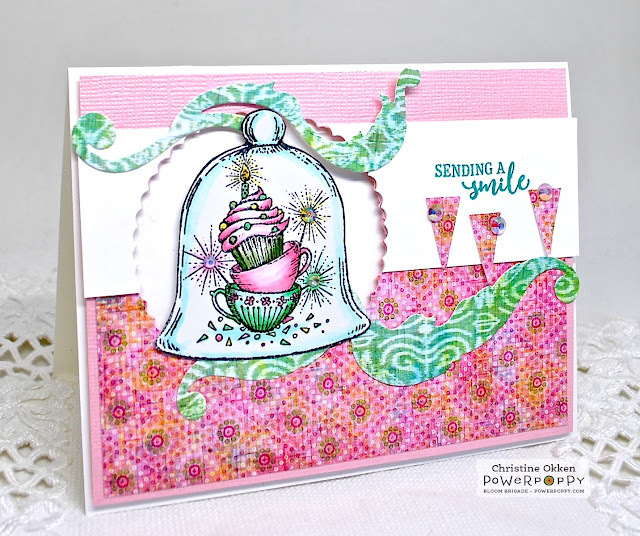 Love that pretty paper and the fun elements you added. I know I'll be blown away by Marcy's new release. I always am! Congratulations to your daughter on her accomplishment! I know how proud you must be. Enjoy your hiatus.